Makes the show look exciting, huh? 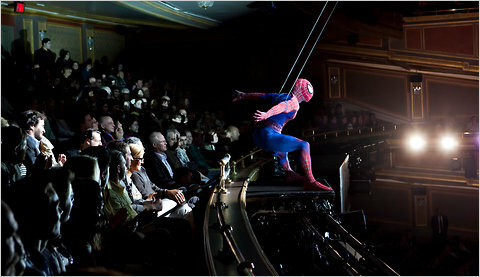 Spiderman is incredibly dynamic, but look at that audience... I mean... they don't look thrilled. They really look like they're just sitting there. I imagine such a production would be quite hard to pull off, but if it's done well I believe it could be really good. We can't really judge it because the audience doesn't look to thrilled though, but it is an interesting point to raise. I imagine that it's probably for a younger audience. It's one I'd be interested in going to see though, both out of curiosity and for a flashback to my childhood roots.